This award-winning service department is ready to help you with whatever you might need, with convenient walk-in oil change hours and plenty of appointment times to fit your schedule. We are looking forward to working with you here at Byers Airport Subaru, By The Airport! We here at Byers Airport Subaru in Columbus, OH know just as well as you know: In order to keep your Subaru vehicle in the best condition in the Columbus, OH area, you should schedule an appointment for your Subaru. At the Byers Airport Subaru Service Center we can make sure your 2018 Subaru Impreza is prepped for great performance. We have certified technicians that work around the clock putting Subaru drivers back on the road. Whether you are due for your Subaru recommended scheduled maintenance or just need to visit the Subaru tire center, contact Byers Airport Subaru. 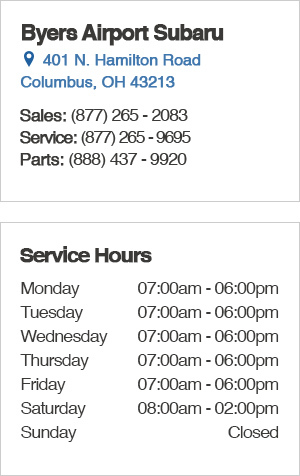 Also, take a look at popular Subaru services! In the unlikely event of an accident, the Byers Collision Center has got you covered and will fix your vehicle right away. If you have any service questions please give us a call at (877) 265-9695 or come see us in person. We're conveniently located at 401 N. Hamilton Road and are here to help sustain the life of your vehicle.